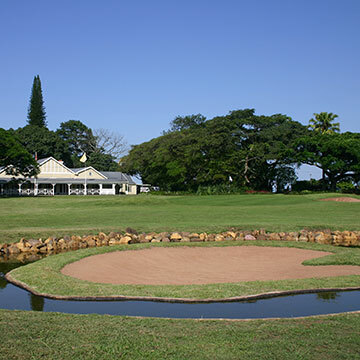 One of the oldest golf estates in South Africa is the Eshowe Hills Golf Course. The golf course is situated 500 meters above sea level on the north coast of Kwa-Zulu Natal. Established in 1907 by the local community, the dream of a golf course became a reality. In the 1950’s the golf course was upgraded by Bob Grimsdell. An avid golfer himself, Bob Grimsdell was South Africa’s top golf course architect for nearly 50 years, starting in the 1930s until his retirement in the 1970s. The course which winds its way through the Dlinza Forest, is not large and whilst it has a degree of difficulty, a game can be enjoyed by golfers of all handicaps. A park like character has been introduced with five new water holes, attracting a wide variety of water birds to join the prolific bird life already living around the course. A great deal of thought has gone into keeping the environment eco-friendly in order to attract birds, mammals and buck to the area. Duiker, bush buck, wild pigs and smaller game like mongoose and hares co-exist side-by-side, in harmony with nature and each other. Accommodation is available on the golf estate and the Country Club has various sporting facilities, including a new in-house gym. Eshowe is only a one and a half hour drive from the King Shaka International Airport and only hour from the bustling seaside town of Ballito. Close by are the wonderful white sand beaches and warm Indian Ocean for you to relax whilst not on the golf course. Some of the best Big Five Game Parks in South Africa are also just up the road. So if you are an overseas or local golfing fan and looking for golf estates in South Africa, then the Eshowe Hills Golf Course is definitely one for your bucket list.